Denon’s DP-30L is an excellent turntable with great features like a quality motor, solid chassis and excellent speed-control circuitry. The DP-30L weighs in at just under 10kg, much more than today’s lightweight decks. This deck also has commendably low wow and flutter. This is in part due to Denon’s use of unique speed control methodology. Unlike most other manufacturers who use hall sensors or printed circuit traces to generate the speed control signal, Denon chose to print a magnetic strip encoded with a waveform, on the underside of the platter. 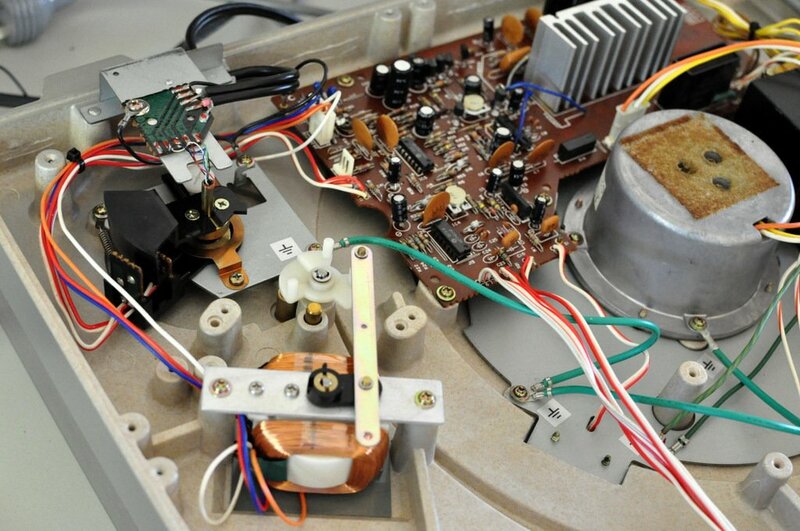 This strip is read back by a magnetic tape head, very similar to the type you’d find in a cassette deck. 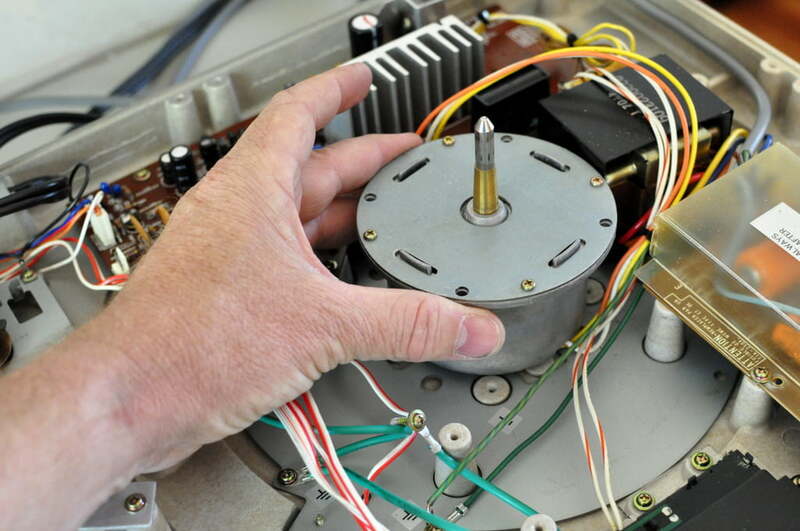 As the platter spins, the tape head reads the signal from the strip and feeds it into a comparator. 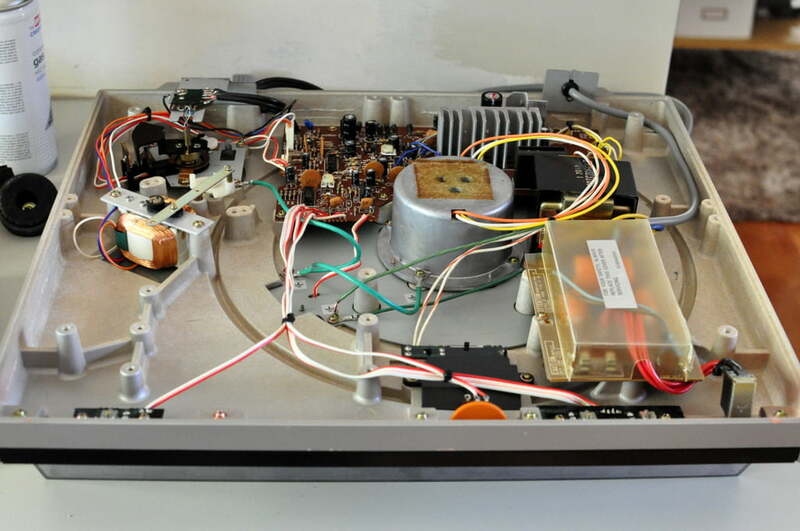 A reference frequency is also fed into the comparator. As its name suggests, the comparator ‘compares’ the two and speed adjustments are made based on the difference between reference and generated frequencies. Denon utilised this method of speed control in all their direct drive decks from this period, and it works very well. 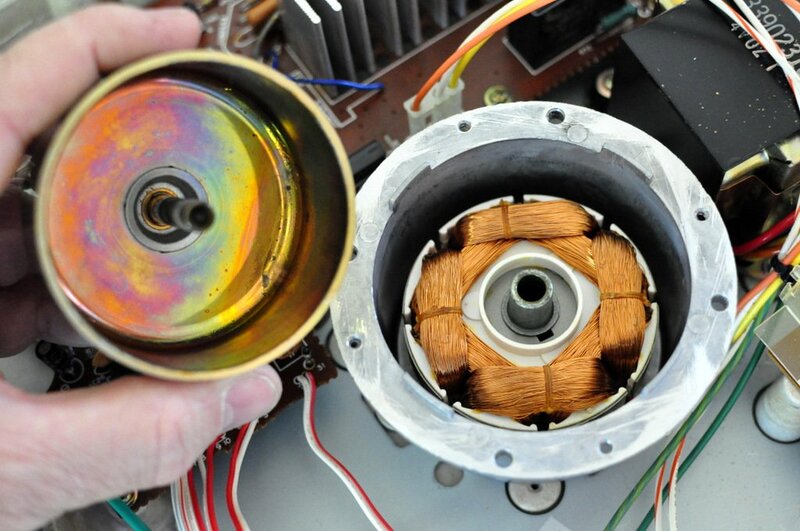 In fact, it’s more reliable than some other methods of sensing rotational speed. Of course, speed control relies on the measured signal being precise. Nothing is perfectly machined or completely flat, so some wow and flutter is inevitably ‘built in’. The result is still usually far better than belt-drive decks. 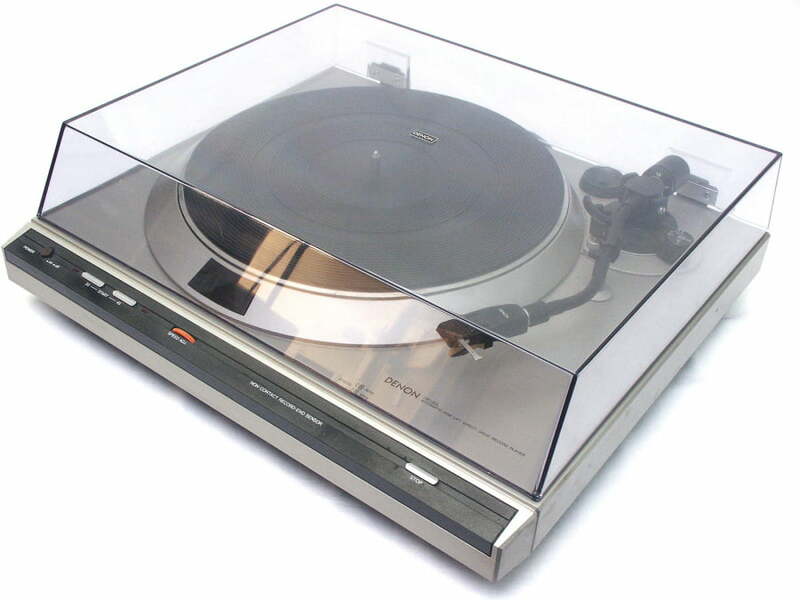 You can read more about the Denon DP-30L at the awesome website Vinyl Engine! The motor isn’t quite as solid as the motors of older Denon decks like the SL-7D, but it’s still a decent design and should last for many years. The DP-30L is easy to work on in typical Denon fashion. Everything is well laid out and the circuit board and parts are of good quality. All control circuitry is on one large board. 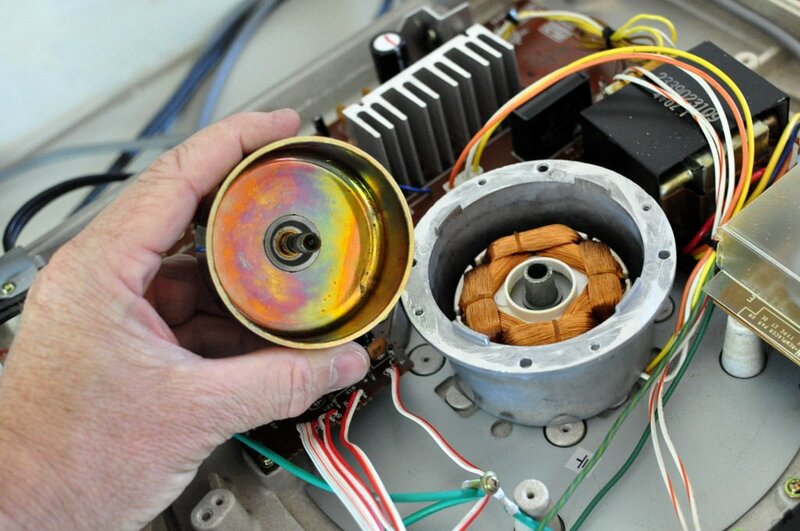 the heatsink is for the motor driver transistors. Close up of the rotor and shaft, note the concave end, where the ball bearing sits. Clean her up and then add a few drops of synthetic bearing oil. The Denon DP-30L is a popular and easy to find deck if you are looking to buy one. The DP-30L would make a perfect deck for someone upgrading from a belt-drive deck, perhaps buying their first proper direct-drive. It would certainly make an excellent alternative to the plastic junk you can find new for similar prices. You can expect dramatically improved pitch accuracy, lower rumble and more predictable operation from a quality direct-drive deck like the DP-30L. You’ll also get a nice tonearm and the ability to play with most medium compliance MM and MC cartridges. Get a DP-30L serviced and set up properly with a decent cartridge and you’ll have an excellent vinyl spinner that will provide many more years of listening pleasure. How did you remove the platter from the DP30L? How much oil? Hi Gary, make sure they pay you in full for the damaged deck as it is a write off. Nothing like this is available now and parts have not been available for many years. Great revue Mike, thanks. I have a Denon DP 30L that I’m about to fire up again after a 25 year hiatus. Any advice and also any thoughts on cartridge/stylus upgrade. I’ve been told by the local store they cant source a replacement shure stylus. Hi Chris, thanks for that and yes, there are lots of options. If you like the Shure, you can go for a modern equivalent in the M97xE, an excellent entry level proper moving magnet cart. Otherwise there are always the usual Ortofon 2M Red and Blue. Much depends on your budget, and you want to make sure the compliance match between the arm and cart is good. Hi John, thanks for getting in touch. Given that these are long since out of production, your best bet would be to scour eBay for a spares unit or spare lid. You could also possibly get one made, several places in Aus are doing this now, including Plasfab. Hope this helps! I used auto polish on mine, its still not perfect but it did come up very nice with minor scuffing removed & clarity restored.